By day, Johnny Peppinger is a student-services specialist at Neumont University in South Jordan. 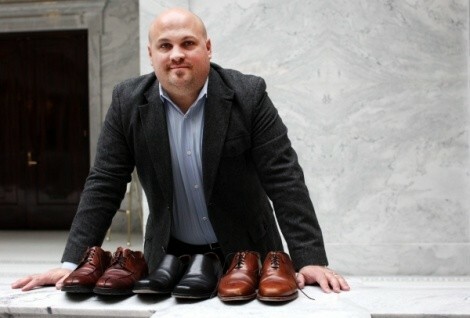 By night, he works from home as a shoeshiner, returning lawmakers’ scuffed shoes to their former shining glory. His drop-off bag service is located at the Capitol Hill Association in the basement of the Utah Capitol. Peppinger talked to City Weekly and revealed that you can tell a lot about a legislator by his shoes. What kinds of shoes do you see on the Hill? A lot of legislators have really, really nice shoes, expensive shoes. Some of them will take expensive shoes and put inserts in them. They talk a lot about the marble up here and how it hurts their feet. So, you get a spectrum of nice shoes with inserts to protect their feet or inexpensive, just really comfortable, shoes. Based on the shoes you’ve seen, how did the legislative session go? If I can overgeneralize, people were pretty busy here. I would see lots of scuffs on the same pair of shoes. Oftentimes, I would shine the same shoes, more so than last year. I don’t know if that’s because people are hustling around or doing other things. I’m hoping they were busy, scuffing them up and wearing them out. What does the shoe say about the lawmaker? Shoes tell a lot about a person’s personality and where they’re coming from—especially here on the Hill. I do see a correlation between the shoes and how loud an impact they’re making here. I have theories. You can buy new shoes fairly cheap. But people who spend money on shoes—it’s something you can take good care of and have for quite awhile. And I think that tells a lot about a person. How did you start working at the Legislature? I started doing events, and I was asked to do a Republican breakfast a few years ago. At that breakfast, I was approached to do a drop-off here at the Capitol. From that point, we’ve had a drop-off service, but we’ve been trying to evolve into an actual shoeshine stand. Do you think the art of the shoe is being lost? For sure. We call those things the lost arts: tailors, shoeshiners and cobblers. We’re becoming a lot more of a consumer nation. It’s just a lot easier to buy a new pair of pants or shoes. It tells a lot about where we’re at. Which political party produces better tippers? I would like to think Democrats—a little more liberal in their spending. Where do you shine the shoes in your home? My “little casbah.” We’ve been working on our basement, so I have this room downstairs, and it has all my stuff. I love to get old radio programs from the library, you know, when people didn’t have televisions—like Lone Ranger stories on the radio—and get in the groove that way. That’s the mindset I have. I love jazz, too. I put it on sometimes and have a few cocktails and shine some shoes. I heard you’ve worked as a therapist. Is shoeshining your personal therapy? In talking with other counselors and therapists, I found that everybody has their own quirky thing they have to escape. I don’t know how it evolved into shoeshining for me. During shoeshining, immediately, I can see change in the shoes. In working with people, you could go years and years and not see a lot of change. It was something I could get immediate gratification from by putting in work and seeing differences. Why did you begin shoeshining part time? I’ve always had a fascination with old barbershops and shoeshines—just kinda taking it back. My grandfather was a barber and his barber chair sat in his basement forever. Growing up, I wanted to be a barber. I always had a fascination for shoeshine and it just kind of came together.